Known for their leopards like markings and aggressive wild appearance, Bengal cats are lovely domestic animals. These exotic looking cross bred Bengal kittens, were developed by selective breeding from hybrids of the Asian Leopard Cat (ALC), with the domestic cat. The goal was to create a confident, healthy, and friendly cat with a highly contrasted and vividly marked coat. Do Cats Really Know Their Names? With its distinctive spotted coat and its large size, the Bengal cat looks like a wild cat on the prowl. 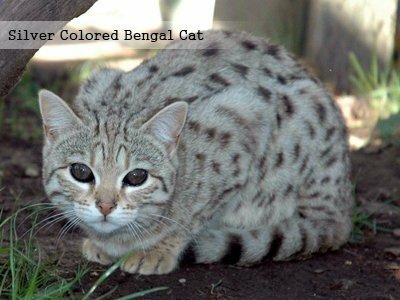 Since one of their ancestors is the small, wild Asian leopard cat, they possess the characteristics of both wild and domestic cat. Bengals (Bengal cats) take their name from the Asian leopard cat’s scientific name, Felis bengalensis. They were cross bred between an Asian leopard cat and a domestic cat in the 1950s. Only in the 1960s where they let to be purchased at pet stores. Jean Mill, a breeder in California, was the first to make such a cross. The name Bengal cat was from the taxonomic name Prionailurus bengalensis of Asian leopard cat. Wild appearance with rosettes or arrowheads or large spots is their trademark. Their body structure resembles that of an ALC. The Bengal cats are a strong, graceful, and agile athlete. At maturity, an average male Bengal breed cat will weigh about 10 to 15 pounds and female Bengal cat will weigh about 8 to 10 pounds. Some adult male Bengals may weigh about 20 to 22 pounds, but this is abnormal. These average weights are for the healthy cats, not fat cats as they are big by nature. Black color patterns or chocolate brown color patterns appear on the light golden skin of the breed cat. The eye color of this type varies from yellow to green. Light Golden Colored Bengal Cats have black feet and their nose is brick red in color. This Bengal breed cats’ tail is dark brown or black with light stripes ending in black. This breed cat variety can be identified by the presence of dark chocolate or black pattern on their dark gold colored skin background. Dark golden colored Bengal cats have nose color in brick red and the fur around the mouth is white in color. The light colored spots on their belly look appealing. Their feet and tail are dark brown or black. Brownish gold skin color with appearances of black patterns is evident. They have green or yellow color eyes and ears are dark and ginger colored. Their belly is light golden colored with black spots and their nose is brick red in color. Their feet are always black. Dark ginger color patterns appear on light ginger or golden color skin background. They have a brick red color nose with yellow or green eyes. Their belly is lighter with spots. With dark ginger colored tail ending in dark stripes, Cinamon-Sorrel colored breed cats have dark brown feet. They have greyish beige skin color with dark brown or black patterns. Green or yellow colored eyes are prominent. Brick red colored nose with the edge of the mouth in black color. The appearance of spots on the light colored belly is evident. Their feet are black in color. Dark greyish brown, greyish black or carbon colored skin with appearances of dark patterns is visible on the fur. Green or yellow colored eyes are evident. Their nose is brick des in color. Their feet are always black. Silver colored Bengal breed cat have silver grey fur with patterns in black or dark grey which is eye-catching and nice. Their eye colors are greenish grey or yellowish grey. 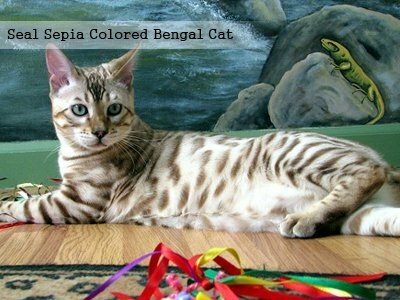 Dark silver striped tail with black feet is always seen on this type of Bengal. These Bengal cats have a light greyish blue or light blue colored skin with visible metal grey patterns on the fur. 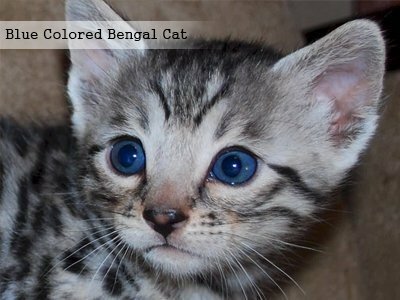 Blue Bengal breed cat is very rare to find and have a lot of demand among Bengal cats and kitten breeders. These are often referred to as black panthers because of the appearance of black patterns on the black background. Black colored Bengals are less famous among the breeders because of the rarity of the breed. Black colored Bengals are often showcased in exhibitions due to the rate of increase in black Bengal admirers. 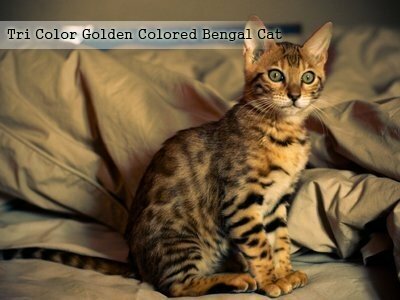 These are brown snow Bengal cats born with brown patterns with beige colored skin. Their base color becomes yellow with age along with their patterns which turn dark brown. Their eyes are either yellow or green and the color of the nose varies from brick red to brown. These cats have lightly skinned bellies and their tail is black. These are grey snow Bengals with completely white background and very light brown patterns on it. Their color darkens with age which leads to light brown patterns on the beige background. One rare feature of this snow Bengal is the color of their eyes which are always blue. Their nose is brownish pink and their feet are always brown. 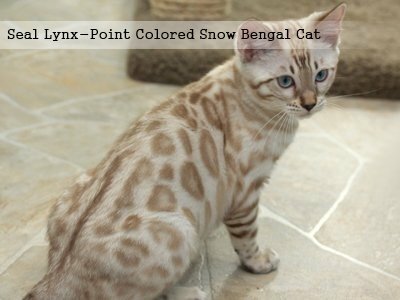 This snow Bengal is born with milk chocolate colored patterns on the pale white background. 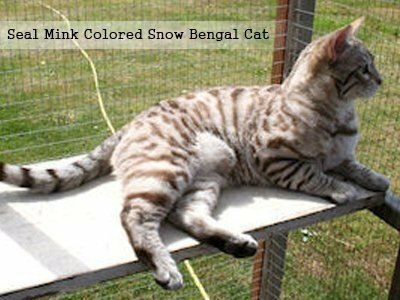 The color also darkens with age just as the other snow Bengal. Seal mink snow bengal cats have a beautiful watery blue or greenish blue color eyes. Their nose is brownish pink and their feet are brown in color. Bengal cats are the most famous feline breed in the world. Irrespective of pattern or color, this type of cat is renowned for its outgoing personality. These cat varieties are playful and fearless. The inquisitive nature of this cat makes it an ideal companion. 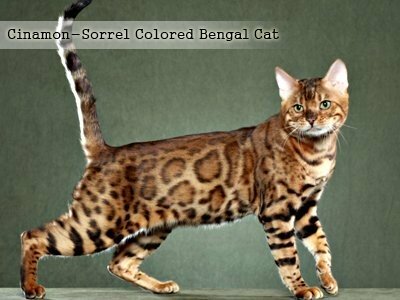 Remember Bengal spotted cats have markings that are asymmetrical in nature and marbled Bengals also have them. How To Spot a Bengal Cat? Noticing physical appearance is one way to identify a Bengal cat as they have a distinctive shiny coat. Check for a well-built body structure. Unlike other cats, Bengals have a large athletic well-built body. Bengal cats are descendants of wild Asian Leopards so look for active and energetic behaviour as Bengals spend most of their time for playing and less time for napping. Listen to their distinctive loud and vocal voice which is different from that of any domestic cat. Consult a breeder for getting a professional verification and approval. Glitter – This is a special characteristic feature of the fur of the Bengal cats. This quality is most visible when the fur is exposed to sunlight or specific spotlight. Patina – This effect appears in any color or pattern. The black hair blurs the basic black contour and brown pattern on the back and shoulder of the cat. This creates the effect of fadedness like patina. This appears all over the back of the cat. Ticked – The randomly appearing dark and light stripes on the cat’s hair is a spectacular feature of the Bengal cat which is also called as the ticked pattern. This creates a special wild effect on the fur of the cat. Bengal cats are talkative in nature as they put in efforts to communicate their needs and longings in ways possible. They are highly territorial and demand large spaces just for themselves. These breed cats are very selective about toileting and want their toileting tray to be spotless and clean each time. They have a destructive nature which leads to damage of things at home such as wires, furniture etc., Bengal cats require new toys often because they get bored easily and also because they destruct their toys often. These cats seek a lot of attention from their master and enjoy the attention they get. They are very friendly and loving by nature. This cat type is easy to train and are quick learners. They like getting wet and playing in the water, unlike the other cats that run at the sight of water. They are excellent bird hunters.Bengal cats are food lovers and enjoy devouring their food. The British Shorthair Is An Affectionate, Easygoing Cat. It Enjoys Love And Care. Check Out The Size, Personality, Price, And Lifespan Of This Curious Cat. Male Cats are mostly infertile; however, some occasional male cats have the ability to reproduce. The female cats are all fertile. They start breeding from when they are one year old and retire from breeding when they are 4-8 years old depending upon the individual condition. The Bengal kittens need no special care as they need the same amount of care and attention that any domestic kitten requires. Though these are wild by nature, raw meat can cause food poisoning. Bengal cats love chicken so an unseasoned cooked chicken meat is all what they want with their dry or soft food. Bengal cats are no more aggressive than an average domestic cat and are very loyal and friendly by nature. These beautiful looking cats are not a well-behaved lap cat and they misbehave a lot outside. They hide anything they find attractive to them, right from expensive glittery jewels to important paper documents. When they are bored or let inactive, they start biting anything and everything that comes in front of them. They want an entirely clean and spotless tray to defecate if their tray is not cleaned several times in 24 hours they find their own toileting place. One has to hold the Bengal cats always busy to keep them from using their energy for negative activities. Bengal cats are not for the inexperienced as they require high maintenance and experienced caretaker to handle. Hyperglycemia In Cats Is The Presence Of Higher Levels Of Glucose Than The Standard Level In The Bloodstream. Discover The Causes, Symptoms And Treatments. A heart condition Hypertrophic Cardio Myopathy (HCM) is common in Bengal cats. But these occur only in the older cats. The heart muscle thickens, which makes the organ work much harder leading to numerous problems. The disease also leads to congestive heart failure, resulting in death. Early signs of cardiomyopathy include panting and lethargy. An eye condition Progressive Retinal Atrophy (PRA) causes the deterioration of the retinal’s rods and cones eventually causing blindness. Even young Bengal cats are prone to this disease as it is present in their gene itself. The Bengal cats may suffer from cataract which may be removed through a surgery by the Vet. Joint pain occurs only to overweight Bengal cats because added weight puts more strain on the joints. Making sure that the cat stays in a good weight without getting fat would prevent the Bengal cat from getting joint problems. A kidney condition Chronic Renal Failure (CRF), is a common problem in older cats. The most noticeable symptom is an increase in water consumption and urination. There are several conditions that can cause this disease. The symptoms of kidney failure are not seen until approximately 75% of kidney tissue is non-functional. Kidney failure is the most common cause of death in older cats. Long-term feeding of an all-dry-food diet will result in Chronic Renal Failure. Chronic kidney failure is progressive and incurable. No conventional or alternative medical treatment can reverse its course since the disease involves the loss of kidney cells and replacement by scar tissue. Cost of a High-quality cat or a kitten ranges from $1000 to $2500 depending on the markings and colourations. The rarer the cat, the higher the price. You can buy Bengals from licensed and registered Cat lovers of the United States of America. Sled Dogs Participate In Various Expeditions- From Transporting Explorers To Racing In The Famous Iditarod Trails. Check Out The Types, Facts, And More. How much is a Bengal cat/Bengal kitten? 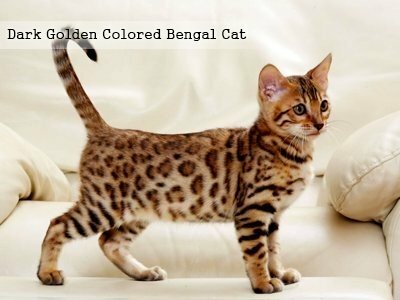 Before you buy or adopt a Bengal cat, it is necessary to do some groundwork regarding what type of Bengal cat you are looking for. These cats normally range from the US $1000 to $2500. How long does it take for a Bengal kitten to fully grow? The average cat is considered fully grown when it reaches anywhere between 1.5 to 2 years of age. An average Bengal(female) and male will weigh not more than 10 pounds and 15 pounds respectively. This cat breed is really unique and not like other normal cats. 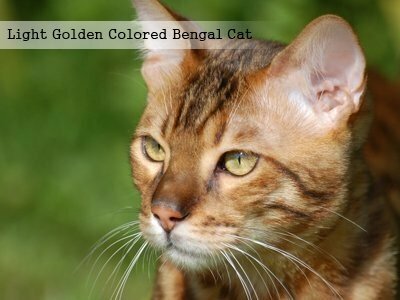 In general, Bengal cats have many qualities one can find in domestically bred dogs. Normally, Bengal cats are very affectionate. They can be easily trained due to their immense intelligence level. What age does a Bengal cat stop growing? It varies from one breed to another. Usually, a cat takes around 4 months time from birth to reach the stage of a kitten. The second stage of a healthy kitten takes around anywhere ranging from 0.8 to 12 months to become adult cats. Do Bengal cats like dogs? Every pet, including a dog or cat, has its own individual personality. Mostly, all Bengal cats get along nicely with dogs. Bengal cats usually move well with older children who often enjoy playing and as far as toddlers are concerned, Bengals normally avoid them. Where does the Bengal cat come from? It is generally believed that the breeding of the Bengal cat started in America in the late 60’s or early 70’s. It was Jean Mill who was particularly instrumental in getting these cats recognized by TICA (The International Cat Association). Are Bengal cats immune to feline leukemia? No, none of the cat breeds, in general, have any special immunity towards feline leukaemia. It is the sole responsibility of a good pet owner to test his cats on a routine basis and keep them in a secure and safe environment. 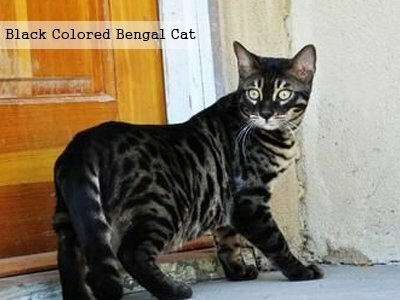 Can Bengal cats be black? 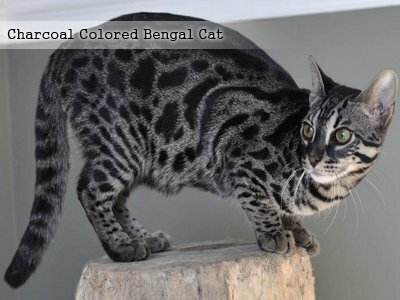 As of now, there are no exquisitely appearing Bengals which are completely black in color. 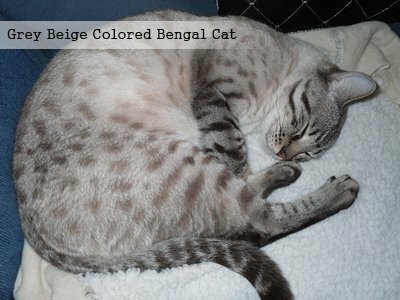 Black markings on a white color skin tone are the typical look of a Silver Bengal. Breeders do not prefer totally black looking Bengals since they do not fetch any points in the championship. What colour eyes do Bengal cats have? Depending on the breed, the eye color of a Bengal cat varies from chocolate brown to green to blue. The Brown (Light) Bengal has eyes ranging from green to yellow color. The marbling, rosetting and spotting can be anywhere between light brown to black. What is the life expectancy of a Bengal cat? They can live up to 14 to 16 years of age, depending on the breed quality and the reputation of the breeder. Are Bengal cats allergy free? In general, Bengal cats require very less maintenance when compared to other breeds. They belong to the category of hypoallergenic cats. These cat breeds normally shed less and have low dander. Other hypoallergenic cat types are Devon Rex, Balinese etc. How tall is a Bengal cat? Savannah and Bengal cats are the hybrids of domestic and wild cats. But, they have a few differences. Markings These cats have crisp spots on their body. Bengal cats have rossets, i.e. is a cluster of spots in circular formation. Color Savannah cats can be in black, brown or in silver color. These cats can be in the color of savannah, but it may come in white as well. Size This cat is twice big as Bengal cats. It can weigh up to 40 pounds Bengal cat weighs much lesser than Savannah. It weighs up to 15 pounds. Temperament These cats resemble the temperament of dogs. It may get into trouble due to fun and excitement. It doesn’t have dog-like temperament, but they need more activities for mental stimulation. Cost It is expensive and can cost around $12000 to $16000. It is much cheaper than the Savannah. These cats can cost from $400 to $10000.